Gorgeous, artisanal craft inspired by Asia. 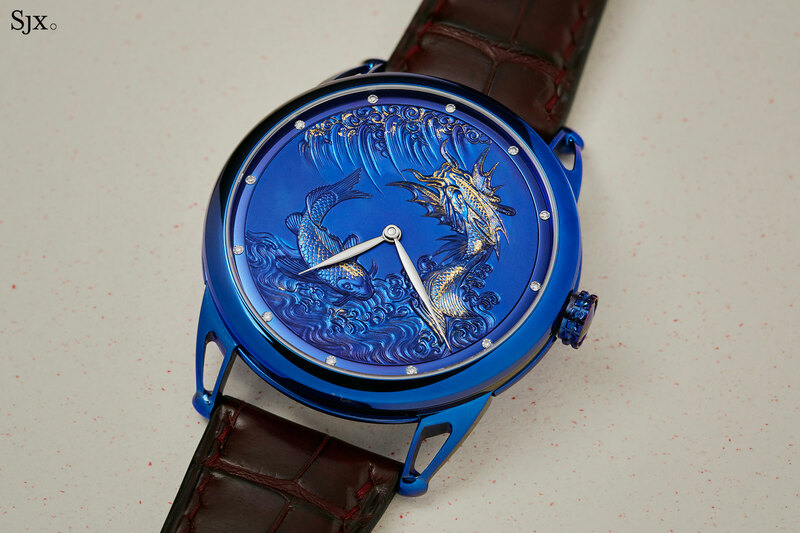 De Bethune unquestionably excels at inventive and complex watchmaking, but it has also drawn on diverse cultures, ranging from the Mayans to the Qing Dynasty, for inspiration. More importantly, the watches have been incredibly striking, avoiding being kitschy, as such watches usually are. 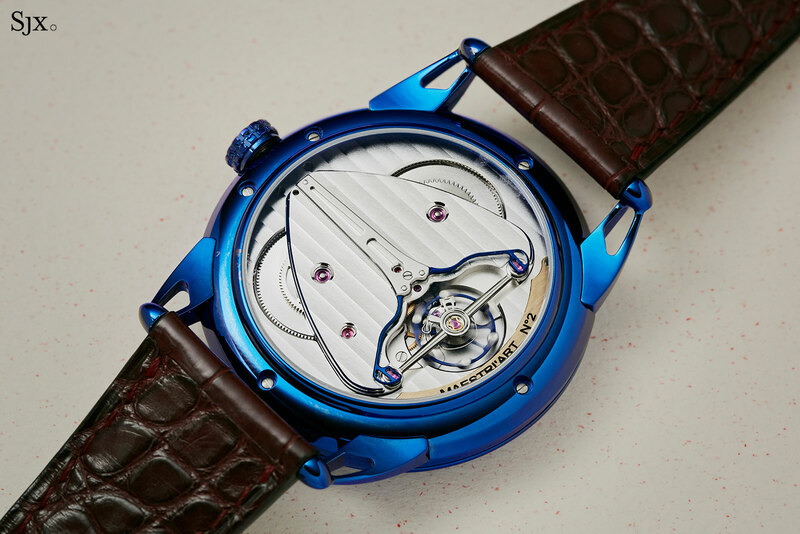 With the Maestri Art I and II pair, De Bethune has done it again. 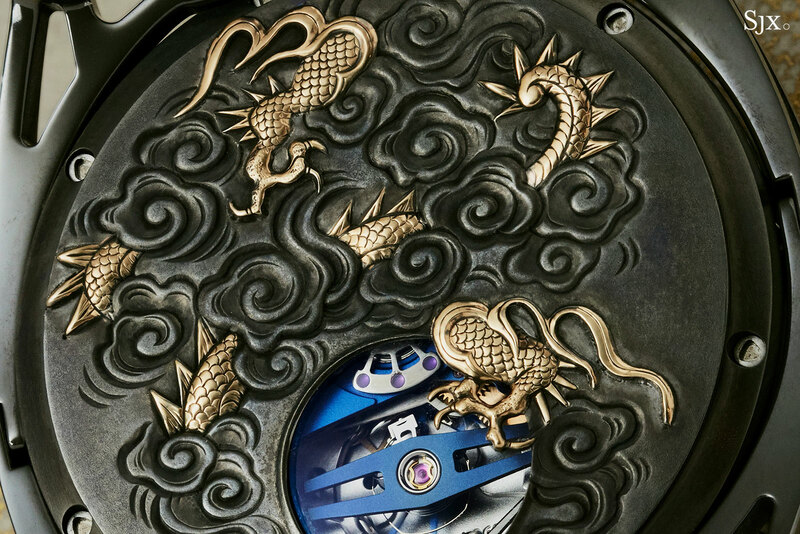 Both unique, one of a kind creations, the Maestri Art I and II are inspired by the art of East Asian, with Japanese and Chinese influences being obvious in the motifs and also materials. Both watches continue De Bethune’s partnership with the talented Michèle Rothen Rebetez. She’s an engraver based in the city of Le Locle – one of the centres of watchmaking in Switzerland – regarded as amongst the country’s best. 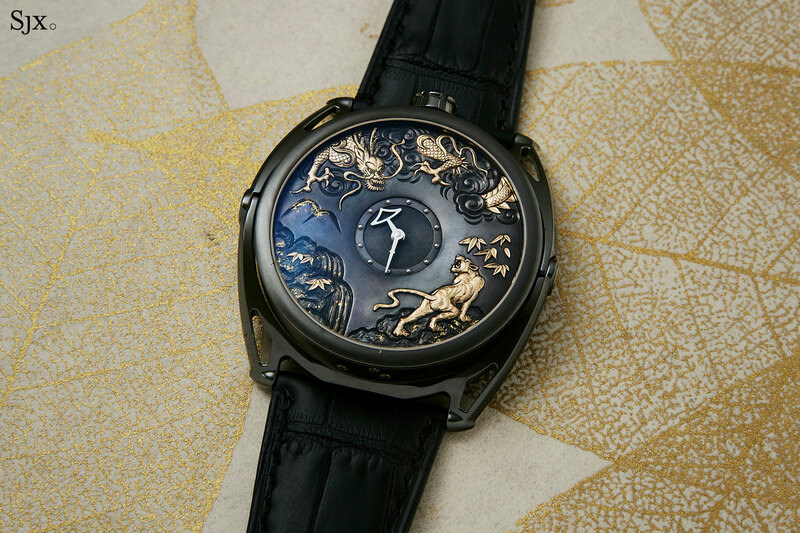 Ms Rothen Rebetez was responsible for all of of De Bethune’s past watches with hand-engraved decoration. 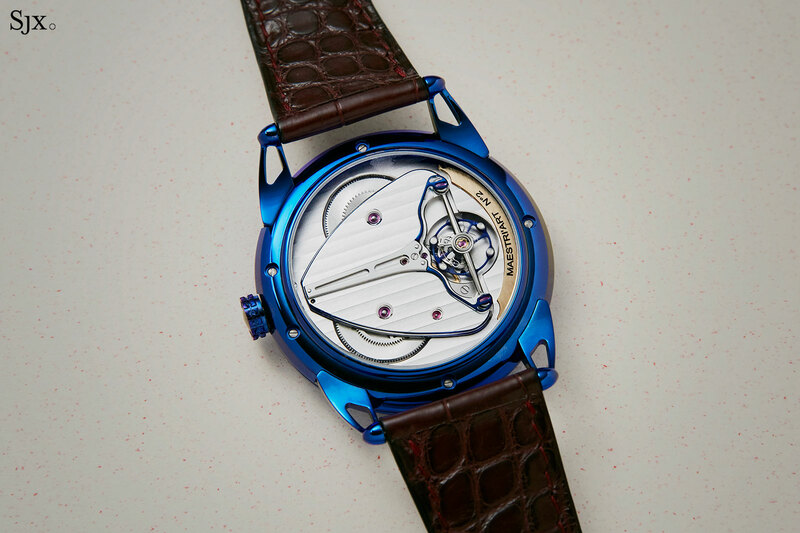 The duo are also unique pieces, although similar creations are available on custom order, since De Bethune is accommodating in such matters. 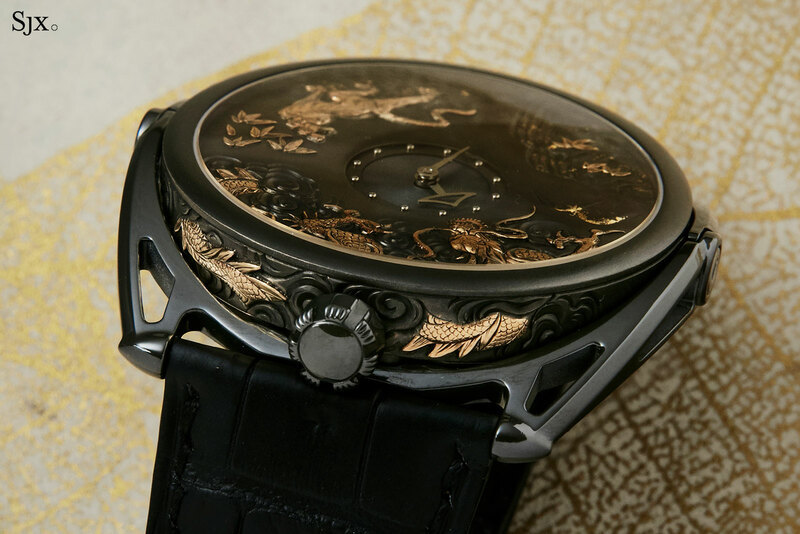 The Maestri Art I is distinctly Japanese in style and substance, executed in a richly contrasting black and gold. Unlike most De Bethune watches, including the Maestri Art II below, that are generously mirror polished, the Maestri Art I is entirely matte black, but with gorgeous, solid gold detailing. In fact, the watch looks like it could be a centuries old object from the Tokugawa shogunate (except for the hands, more on that at the end). The black and colour colour palette is inspired by sword mountings of Japanese katana, specifically the tsuba, or hand guard. Tsuba were typically made of copper alloys known as irogane, patinated black and inlaid with gold. Ironically, while the decoration is absolutely top class, the watch is actually based on the DB27 Titan Hawk V2, the brand’s entry-level watch. That gives the case short, spring-loaded lugs, which means it hugs the wrist and wears exceptionally well. At the same time, the case is relatively compact by De Bethune standards, measuring 43mm wide and 9mm high, made even smaller by its dark finish. While most engraved De Bethune watches are flamboyant, this one is restrained. 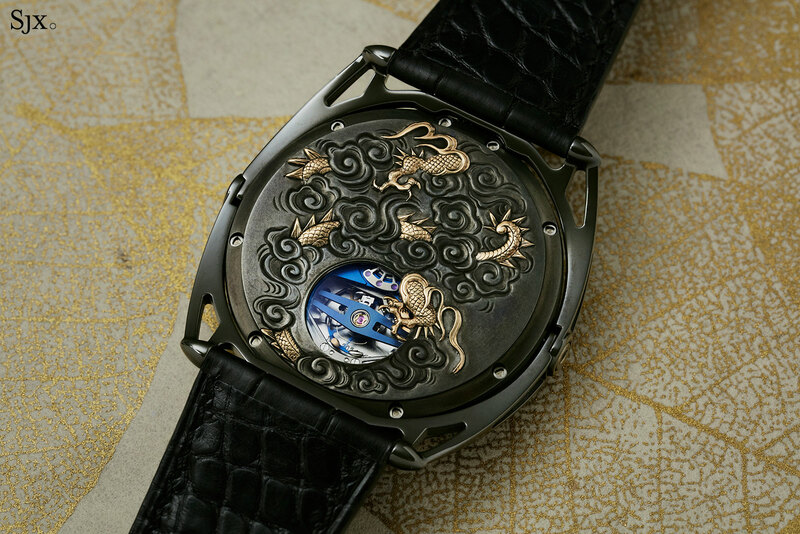 The watch depicts a dragon in the clouds and a tiger on the mountain, along with a waterfall – a motif that is common in Chinese, Japanese and Korean art. Seen as opposing ideas, the tiger is associated with “yin”, while the dragon is associated with “yang”. Alternatively, the tiger is also associated with “west” and the dragon, “east”, each being part of the four mythological animals of Chinese culture, each representing a cardinal point and season. But the motif here is Japanese, evidenced by the three claws of the dragon; Chinese dragons usually have four claws, or five in the case of the Emperor’s emblem. While the lugs of the watch are black-coated titanium, the case, dial and case back were hand-made by Denis Flageollet, the resident watchmaking genius of De Bethune. Mr Flageollet created the alloy himself, and then used the molten metal to cast the components. The alloy is similar to shibuichi, an alloy composed of about three-quarters copper and one-quarter silver. Once formed, the alloy is treated with the niiro process – boiling the metal in a special chemical solution – to give it a black patina. It’s then inlaid with solid gold to create the motif, with certain details like the mountains and waterfall highlighted with applied gold leaf. Incredibly, the decoration covers all faces of the watch, front and back, as well as the sides of the case. As with Ms Rothen Rebetez’s previous work, the engraving is remarkably detailed. 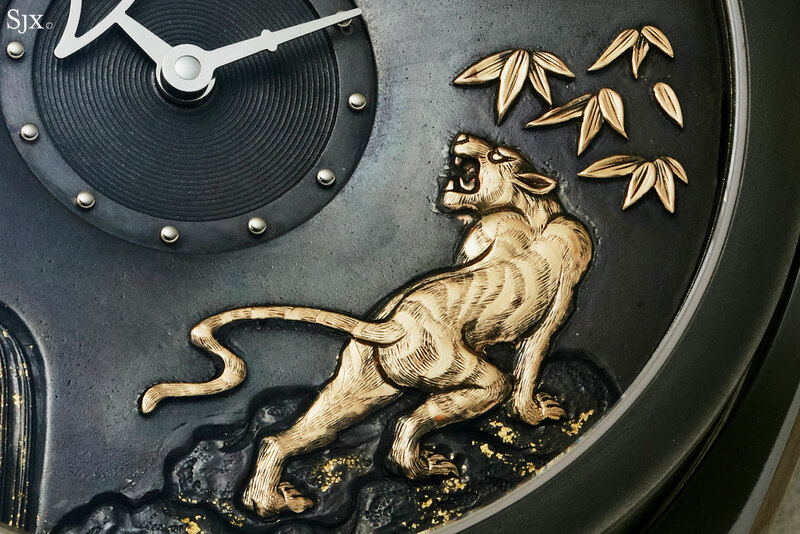 From the stripes on the tiger to the scales of the dragon – the engraving is exemplary. The decorated case back, however, raises the question of how the material will age given long term contact with the skin. Sword guards sitting in museums in Japan look none the worse for wear after a couple of centuries, so that is probably a moot point. Because the watch is based on the DB27, the movement inside is identical, the self-winding AutoV2 that has a 60-hour power reserve. All of the movement is hidden, save for the patented silicon balance wheel with gold regulating masses that’s visible through a tiny porthole. While the watch is beautifully executed in form and substance, it does suffer from a pair of hands that look out of place. The hands are extremely short, understandable given the need to leave the decoration unobscured, and also silver in tone, giving them a good contrast against the dial. But the hour hand is shaped like the roof of a pagoda, which is a bit cheesy, while the minute hand resembles a sword. Together they resemble a pair of swizzle sticks. The Maestri Art I is priced at SFr135,000 before taxes, which is equivalent to US$135,000. It’s a surprisingly steep sum, but par for the course for such a watch. 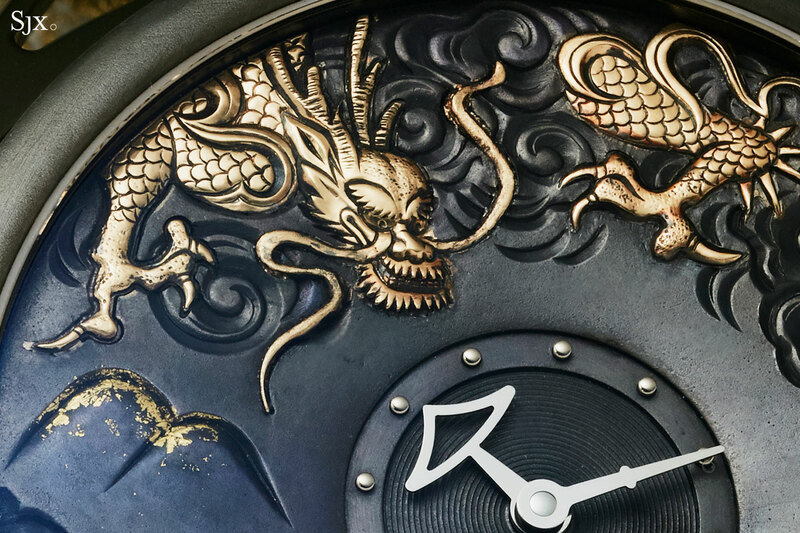 As artisanal decoration on watches goes, this is one of the most unusual and intricate of recent years, so it is probably justified. While the Maestri Art I was unusual in style and materials, the Maestri Art II is a watch in the quintessential De Bethune style. It is less of a departure and less surprising. It’s intrinsically more typical of the brand, which means lots and lots of mirror polished, heat-blued titanium. 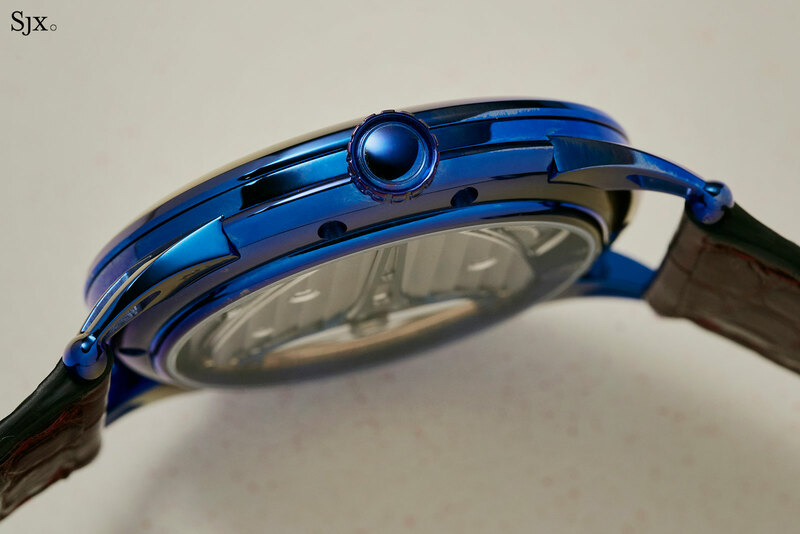 The watch is based on the DB25, so the case is 42mm, titanium, and featuring De Bethune’s airy, open-worked lugs. 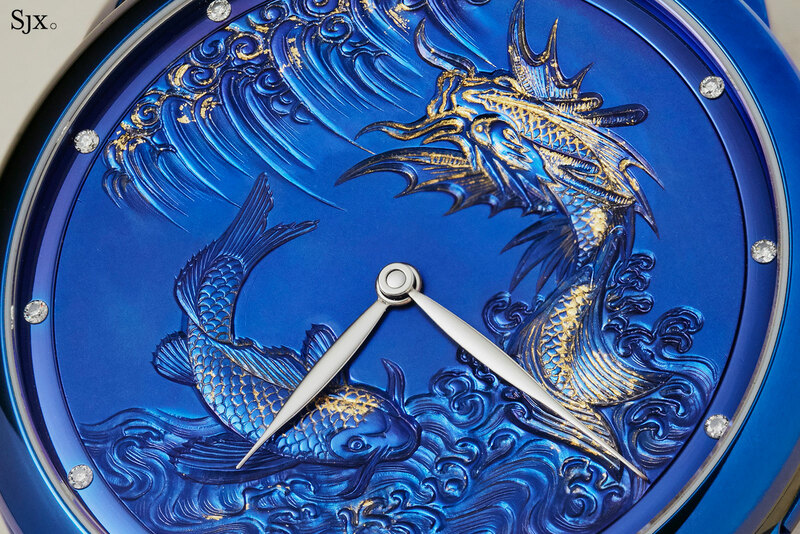 And the motif is Chinese, inspired by the myth of the carp that swims upriver and leaps over the Dragon Gate of the Yellow River, thus transforming into a dragon. 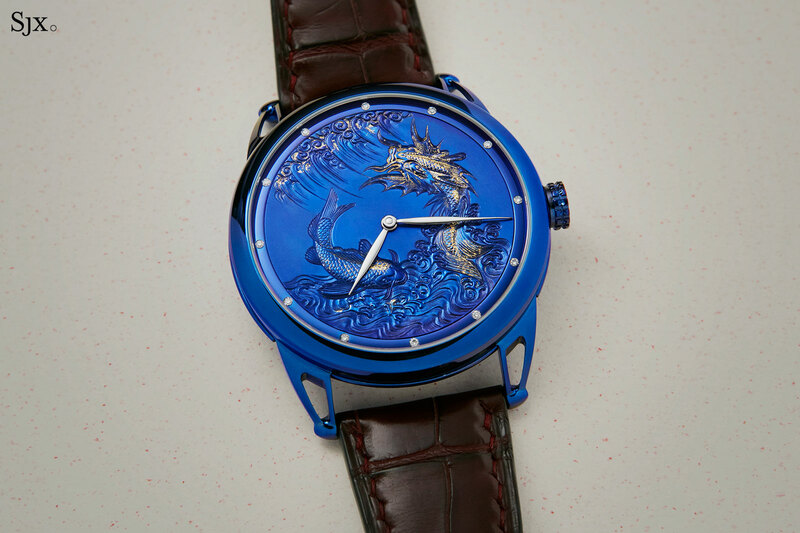 The fable was meant to symbolise success in the civil service examinations of Imperial China, which allowed graduates to enter the government and rise in life, making this something of a watch for students. 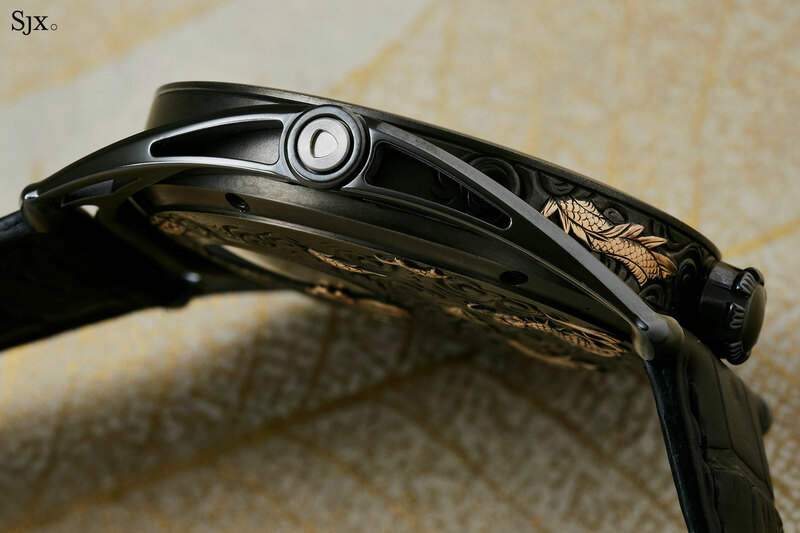 The dial is an expanse of polished, blued titanium that’s been hand-engraved and then accented with gold leaf inlay. Twelve brilliant-cut diamonds form the hour markers, but against the incredible colour and detail of the dial their sparkle is hardly obvious. Fortunately, the choice for the hands here are traditional, fuss-free leaf-shaped hands that are legible and don’t take away from the design. The watch case is light, sleek and richly blue. 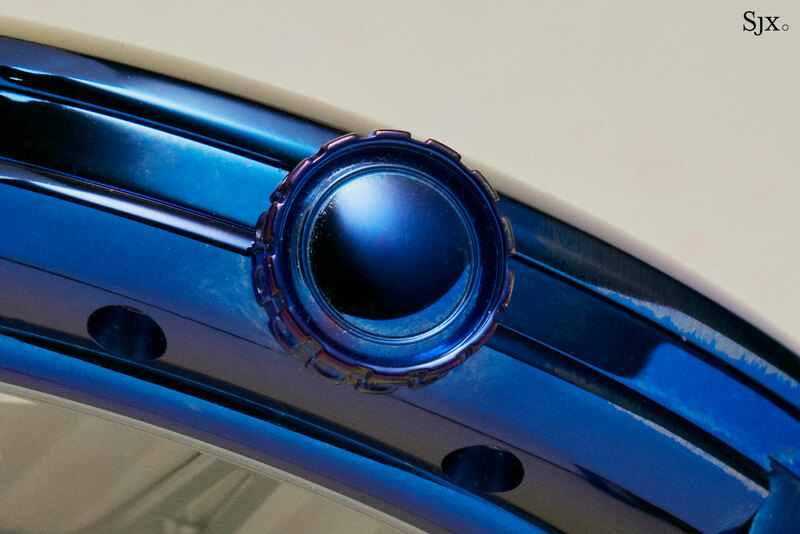 As usual for titanium that’s been heat-blued by hand, the blue is nuanced. There is noticeable unevenness to the colour on the case, but not so much on the dial. That’s a consequence of both the manual blueing process, as well as uneven temperatures across different areas of same component before blueing. Inside of one of De Bethune’s top of the line, hand-wound movements, the DB2005. It’s a large calibre with a delta-shaped bridge, and twin barrels that provide a six-day power reserve. 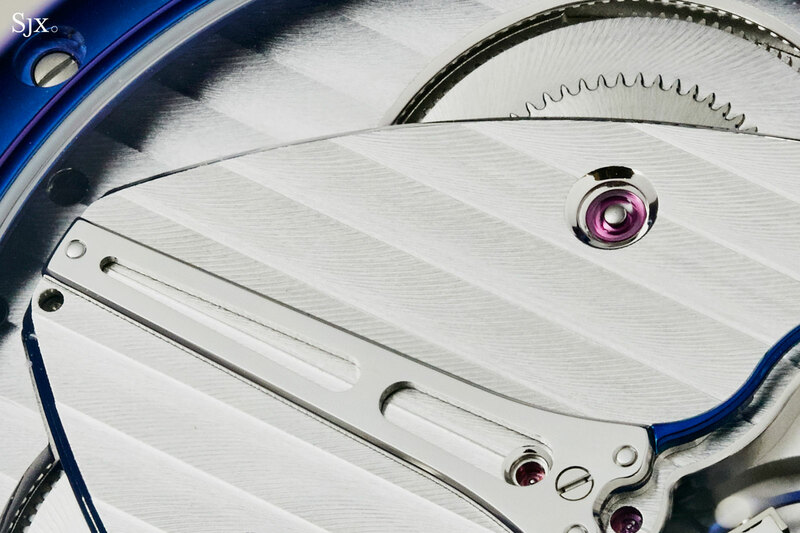 It boasts several of De Bethune’s patented inventions, including the triple pare-chute shock absorber that is made of polished, blued titanium. 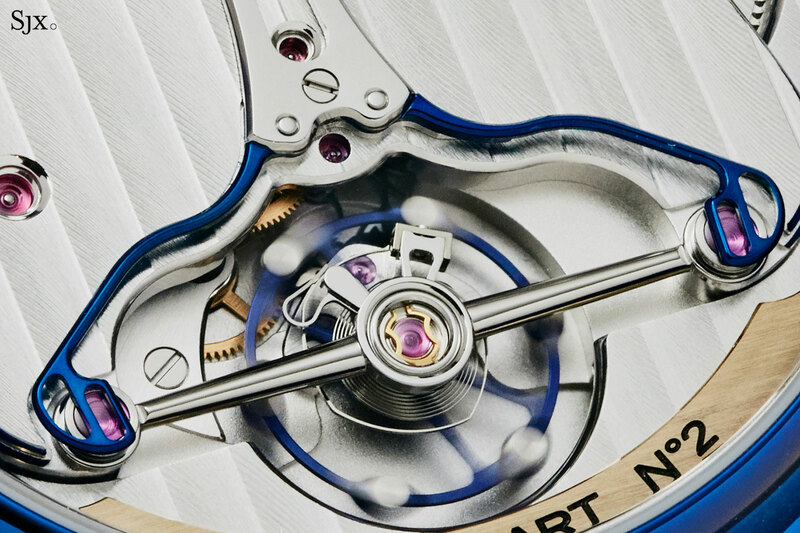 The balance is also made of blued titanium and fitted with solid gold masses, while the escape wheel is silicon. While De Bethune’s movement finishing is neither artisanal nor lavish in the manner of Akrivia or Voutialinen, it is extremely good. Most necessary details are attended to in a fine manner. The bridges, for instance, have mirror polished bevels, but no inward angles. While the slots of screw heads are chamfered and the countersinks for barrel jewels are polished, the base plate has a simple, sandblasted finish. The twin blued arms of the triple pare-chute. 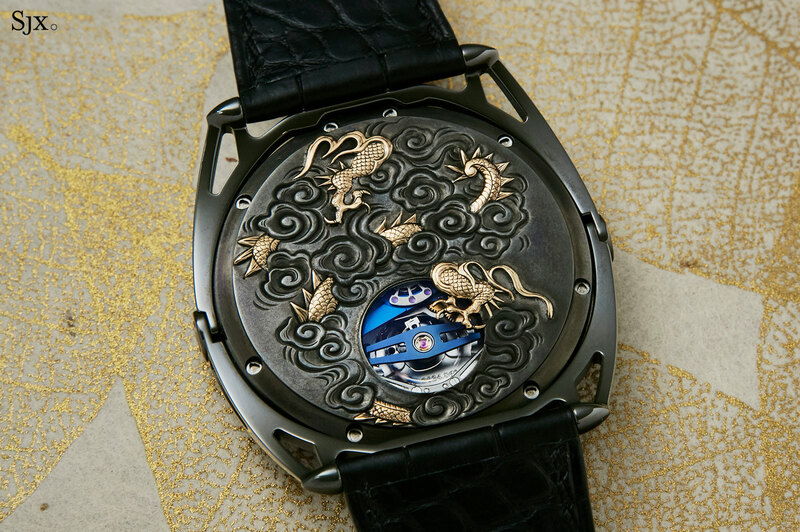 Being more similar to De Bethune’s other watches, the Maestri Art II is marginally more affordable. It costs SFr110,000 before taxes, or about US$110,000. 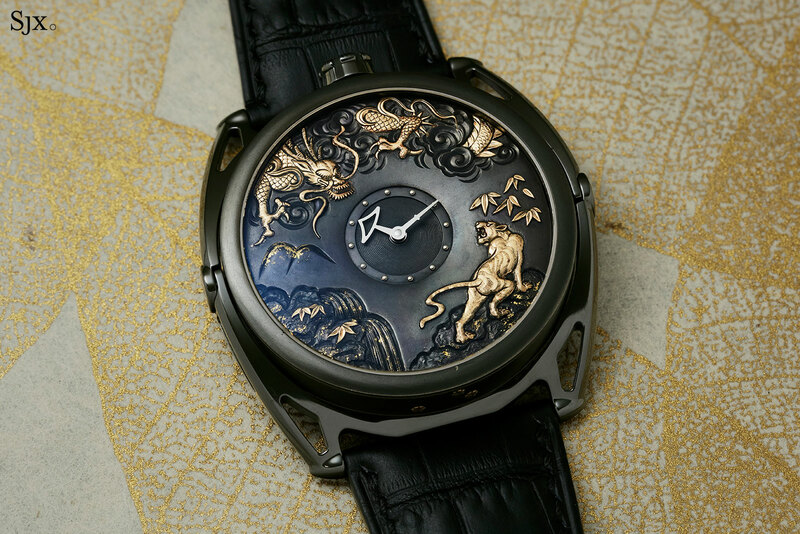 Between the two, the first Maestri Art would be my pick because it is so unusual, but the Maestri Art II screams De Bethune. For someone who wants something representative of the brand, polished, blued titanium is the way to go.